Two articles from The New Statesman and The Economist show that abuse of powers by the police can happen if left unchecked. How does our new Public Order Act square up to this? After the demonstrations during the recent G20 summit in London, the biggest story is not about the alleged rowdiness of the demonstrators but the possible misconduct of the police in handling the protestors as well as their involvement in the death of a British by-stander. This goes to show that the law minister’s rhetoric during the recent debate over the Public Order Bill about believing that policemen are “fundamentally honest” is missing the point: given that the latter are the ones carrying guns and batons, it is important to ensure that there is proper oversight over police powers, which is critically missing from the Bill. Instead, what the Bill does is to grant the police even more abitrary powers. No one would advocate crippling the effectiveness of the police force – but it is crucial to ensure that there is proper accountability when something does go wrong. Worryingly, the government’s track record gives little reassurance that the public can expect such accountability. The truth of the G20 case of Ian Tomlinson and the other one of Brazillian Jean Charles de Menezes, wrongly suspected of being a potential suicide bomber who was shot by British police, came to light only when video footages (from a by-stander and from CCTVs) revealed that what had taken place were contrary to what the police had first claimed. In the case of de Menezes, the police briefed for a full 24 hours that the victim was an Islamist terrorist – “Suicide bomber shot on Tube” was the Sky News strapline – and only eventually conceded that he was innocent. Andy Hayman, then the Met’s head of counterterrorism and intelligence, was later shown to have concealed his doubts about de Menezes’s guilt from the Met commissioner, Sir Ian Blair, during the hours and days after the shooting. Since then, details have emerged of how the police deleted and selectively presented CCTV footage and photographs of de Menezes. Furthermore, it was said that he had been running; that he had jumped the Tube barriers; that he had been wearing a bulky coat; and that he had been challenged verbally by police. In fact, CCTV footage finally released in July 2007 shows a lightly dressed de Menezes calmly picking up a morning newspaper and strolling through the station barriers on to the escalator. Similarly, on the day that Tomlinson died of a heart attack the Met issued a wholly misleading statement. A member of the public, it said, told police that “there was a man who had collapsed round the corner”. Officers, it was claimed, had tried to help medics save his life as “missiles, believed to be bottles”, were hurled at them. The reality, again revealed in video, shows Tomlinson walking with his hands in his pockets, offering neither resistance nor threat to the police line behind him. Next, he is struck around the legs by a baton-wielding Territorial Support Group officer who then shoves Tomlinson to the ground. After “bouncing” – a witness’s word – on the ground, a terrified Tomlinson can be seen looking up in disbelief at the officers, who stand back, leaving the public to tend to him. What connects de Menezes, Tomlinson and countless other victims of brutality is the fact that the police get away with it. Each outrage is treated as an isolated incident; the link running through them is left unmade. “I cannot see how the City of London Police could have been expected to be the right vehicle for investigating Tomlinson’s death, when they were part of the same policing operation,” says the former London mayor Ken Livingstone. Despite the threats to destroy capitalism and hang the bankers, the real hero of London’s G20 demonstrations on April 1st may turn out to be an American fund manager. 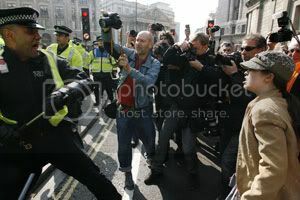 The anonymous capitalist accidentally filmed a policeman assaulting Ian Tomlinson, a newspaper vendor who was making his way home through the protest. Mr Tomlinson was clubbed from behind with a baton and shoved to the ground as he walked away from a line of officers, hands in his pockets. He subsequently died of a heart attack. Just as the shock of that footage was receding, another video nasty emerged. In it a woman at a vigil for Mr Tomlinson on the following day is slapped and baton-thwacked by a different officer. The Independent Police Complaints Commission (IPCC) is now investigating both cases. Given that most of the 5,000-odd protesters had cameras, more may well emerge.